Enhancing the curb appeal of your home or property doesn’t always have to be expensive. Whether you’re looking for some simple, affordable improvements to get a property ready for market or you’d like to just to keep up with your property maintenance there are several ways you can dramatically improve the look of your property without breaking the bank. The exterior surfaces of your home and property get dirtier than most people realize. This can be accelerated if your home and property is situated around heavy tree cover, or if you live near a dusty road or a busy highway. Pollens, tree saps, dust, dirt, soot, and grime all accumulate on the hard exterior surfaces of your home and property. The organic debris leads to the growth of molds, mildews, moss and other unsightly organisms. Power washing your exterior surfaces such as a driveway, patio, sidewalks, retaining walls and any other concrete or “hard” surface on your property is a great way to freshen up the exterior without spending a fortune. Years of grime will be washed away. There are various types of building materials that are more delicate than others and they simply cannot withstand the blast of pressure from a commercial grade power washer. The surfaces include asphalt shingle roofing, cedar shingles and siding, vinyl siding and other types of wood siding. To clean these surfaces the recommended procedure is to use a soft wash. Utilizing special cleaning detergents (enviro friendly) and soft agitation (using brushes) we essentially “gently scrub” the surfaces that need to be cleaned. After they’ve been scrubbed we use a low pressure stream of water to rinse away the dirty suds, leaving you with a beautifully clean exterior. This process is best suited for homes that haven’t been washed in a few years. Although concrete is a hard and durable surface it can still fall victim to erosion from the weather, stains from oils and grease and can be difficult to clean. 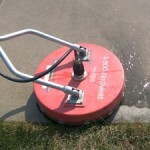 After a good power washing it’s always a good idea to consider sealing your concrete with a special sealer. Sealing your concrete will protect the surface from stains, rain, snow and it will make the concrete much easier to clean. Different stains and colors can be used to improve the appearance of your concrete. Pure Acrylic Sealers: Because of their availability and affordability we often get requests for acrylic sealers. This type of sealer is very popular for exposed aggregate because it offers good protection, enhances the color and provides a nice looking high gloss finish. The downside to acrylic sealers is they aren’t as durable as other products and generally only last for 24-36 months before they will need to be replaced again. If you’re looking to get a home ready for resale then an acrylic sealer might be a good choice. Penetrating Sealers: A penetrating sealer works below the surface of your concrete to seal and protect it. These finishes work on all types of concrete surfaces from a regular broom finish to exposed aggregate and even stamped or decorative concrete. Unlike an acrylic concrete sealer a penetrating sealer will not change the look, color or traction of the concrete. Providing a more durable finish when properly applied you can expect a penetrating sealer to last anywhere from 3-7 years. 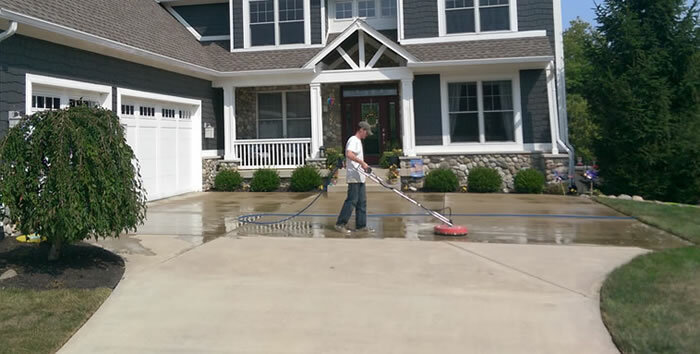 If you’ve got a concrete sealing project for your home exterior give White’s Painting and Power Washing a call and we’ll come out and give a competitive estimate along with some friendly and helpful advice on your project. We understand that you have many choices when it comes to choosing a contractor to power wash or paint the exterior of your home. We just want you to know that when you choose White’s Painting and Power Washing for your exterior painting or cleaning needs you are taking on a motivated partner in making your home look better! "Robert White Painting and Power Washing did an excellent job one my siding. It looks brand new. They went above and beyond the Power Washing, and fixed my siding without any additional charge. I give them a 5 star rating, and would not hesitate to recommend them to anyone. Very Professional & Knowlegeble."